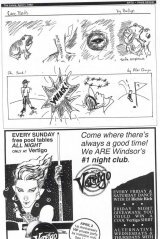 Terry's follow up to The Globe & Mail & Windsor Star was a parody of The Lance itself, a bit of satirical speculation on what a student newspaper would be like if Windsor's Student Council (SAC) got its hands on The Lance and turned it into a pro-SAC house organ. 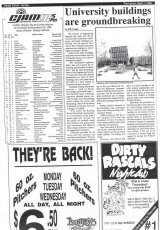 While student councilors frequently grumbled about The Lance's general unwillingness to champion every SAC initiative and editorialize about how SAC was misspending the students' money, few in the sometimes tense Lance/SAC relationship ever had the guts to actually seize control of the paper's offices. 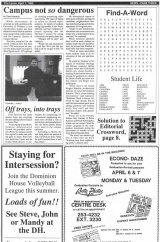 Things looked somewhat worrisome, however, in the Spring of '92 when Student Council elections were held. The president-elect Chris Chang ran on a platform of improving long flagging school spirit. The University of Windsor was rarely anyone's first choice for post-secondary education. If school spirit is defined by the number of people who come out to your football games and homecoming events, Windsor's spirit was lamentable. Windsoradians would look across the border to the University of Michigan (Go Blue!) and only dream of school life where the class of '47 still came out for pre-football tailgate parties. The closest Canadian simulacrum of the fabled American rah-rah sis-boom bah style of education was the University of Western Ontario, which was a two-hour drive away in the white collar town of London. 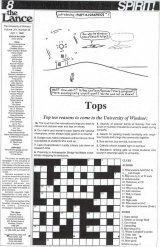 "Now there was a real university," many who attended the University of Windsor would mutter under their breaths. Not only did they have a top-notch business school, more ivy, an on-campus teaching hospital, and dorms where (if one were to believe the legends) every night was something right out of Animal House, they had a good football team and, of course, excellent homecoming events. It was not uncommon to have University of Windsor students shun their own school's homecoming and instead drive to the University of Western Ontario and join in the fun there. Yeah, Windsor was fucked six ways to Sunday and, as I said, SAC President-elect Chris Chang was going to change that. 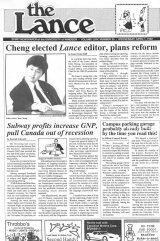 While campaigning, Chang fingered The Lance as one of the biggest reasons for anemic campus spirit. It was a bit reminiscent of Mayor David Burr who, upon leaving office, cited the Windsor Star as being one of the most divisive elements in the city. Yeah, how dare the Star question Burr's use of public funds to fly his secretary/future wife on a business junket. The Lance, in Chang's eyes, was disproportionately critical and deeply cynical. The Lance never focused on what was great about Windsor campus life. It never sang the school's praises. 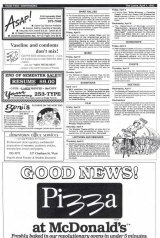 It was controlled by a clique of students who were not only out of touch with campus life but The Lance's editors actively denied the average student a voice. Ho ho! In some ways Chang's criticisms of The Lance was almost a personal attack on Terry as he was editor of The Lance that year. Terry cynical? Well, he is actually. But one could hardly call Terry the leader of an elitist, exclusionary clique or someone that would seek to deny students a voice. 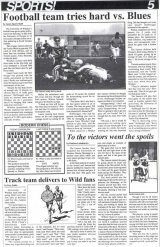 If The Lance seemed out of synch with campus life or seemed to have a homogenous voice that spoke a little differently from your average frosh with six pack under arm, it was because turning out a newspaper every week required people who were willing to write and to accept story assignments and execute on them. Sometimes people might even be asked to generate their own ideas. Oh yeah, you wouldn't be paid for it either. "Hi, would you like to write stories for a whole year about campus club charity raffles, work until 4 am, and not be paid for it? Oh you're a business major and giving away your labor is against your principles unless its for the Conservative Party of Canada and it involves tearing down NDP lawn signs? No problem. 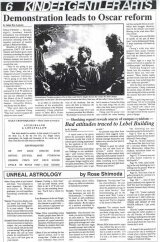 The guy behind you with the well-thumbed copy of Catcher in the Rye is delighted to write the articles in return for some vague promise we'll print his feature about Noam Chomsky being the baddest mother fucker around." Over all, The Lance - A Spirit Paper is probably the weakest of the three parody issues Terry lead the charge on. The Pennysaviour and The Globe & Mail & Windsor Star (and The Border City Lance to a lesser extent) were aimed at hard, established targets, ripe for parody and broad in appeal. 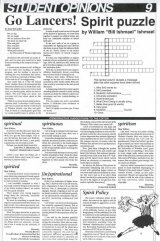 The Lance - A Spirit Paper was predicated on the expressed intent of a nobody with a sham election issue.